Abstract: In the late Middle Ages, there was a series of instances wherein knights vowed upon birds. Two of these, the first and the last, are historical events: The Feast of the Swans with Edward I in England on 22 May 1306 and the Feast of the Pheasant with Philip the Good in the duchy of Burgundy on 17 February 1454. 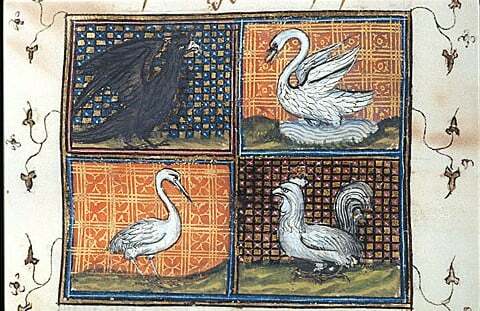 Edward I held the Feast of the Swans as part of his son’s dubbing ceremony, including the entire court taking vows on two swans. The Feast of the Pheasant was an elaborate banquet that Philip the Good used to gather support for a crusade. The other three are literary texts: the Voeux du paon, the Voeux de l’épervier, and the Voeux du héron. The Voeux du Paon contains an account of a group of nobility connected to Alexander the Great at a truce banquet. One of the prisoners accidentally kills a lady’s peacock and the group decides to take vows on it before recommencing battle. The Voeux de l’épervier concerns Henry VII of Luxembourg en route to Italy to claim the title of Holy Roman Emperor. One of his knights accidentally kills a sparrowhawk and they decide, as a court, to take vows on it. Lastly, the Voeux du héron depicts Robert d’Artois inciting Edward III to initiate the Hundred Years’ War over a heron. Each of these instances creates a sub-set, the bird vow cycle, within medieval vowing tradition. The origin of the bird vow cycle lies within that vowing tradition. John L. Grigsby has declared these instances as a crystallization of the gab convention of medieval literature. However, Grigsby ignored the Feast of the Swans and the Feast of the Pheasant since he was concentrated on defining a literary genre. This thesis attempts to show the bird vow cycle as connected this this literary tradition, but also a crystallization of the courtly culture that had developped in the late Middle Ages. It also attempts to show the origins of this cycle—it not only came out of a vowing tradition, but also is tied to King Arthur traditions. The culture of the late Middle Ages was nostalgic and looking back towards an idealistic version of the past— whether in legends like Arthur or historical figures like Alexander. Thus, the knightly bird vow cycle was a particular example of that fantasy in their culture. In conclusion, this thesis not only gathers together what literature there is on the knightly bird vow cycle, but it places it within a literary and historical context. The knightly bird vow cycle would not have been possible without a culture obsessed with fantasy and idealistic courtly culture.